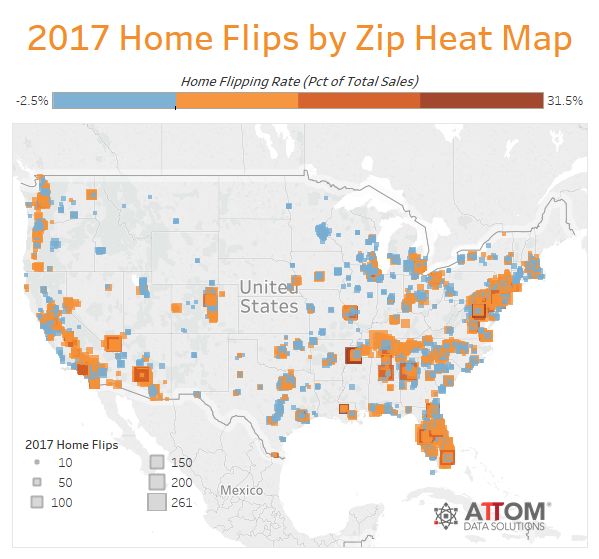 According to ATTOM Data Solution's Q4 and Year-End 2017 U.S. Home Flipping Report, 207,088 U.S. single family homes and condos were flipped in 2017, up 1 percent from the 204,167 home flips in 2016 to the highest level since 2006 -- an 11-year high. A total of 138,410 entities (individuals and institutions) flipped homes in 2017, up 4 percent from the 133,407 entities that flipped in 2016 to the highest level since 2007 -- a 10-year high. "The surge in home flipping in the last three years is built on a more fundamentally sound foundation than the flipping frenzy that we witnessed a little more than a decade ago," said Daren Blomquist, senior vice president at ATTOM Data Solutions. "Flippers are behaving more rationally, as evidenced by average gross flipping returns of 50 percent over the last three years compared to average gross flipping returns of just 31 percent between 2004 and 2006 -- the last time we saw more than 200,000 home flips in consecutive years. And while financing for flippers has become more readily available in recent years, 65 percent of flippers still used cash to buy homes flipped in 2017, nearly the reverse of 2004 to 2006, when 63 percent of flippers were leveraging financing to buy." 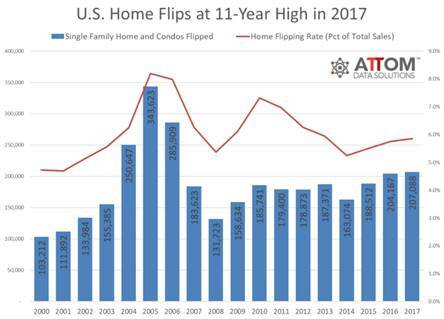 The total dollar volume of financed home flip purchases was $16.1 billion for homes flipped in 2017, up 27 percent from $12.7 billion in 2016 to the highest level since 2007 -- a 10-year high. "We aren't surprised that the dollar volume and share of financed flips are hitting new highs," said Matt Humphrey, co-founder and CEO of LendingHome, which saw a nearly 70 percent increase in its dollar volume of loans on home flips completed in 2017 compared to 2016, according to an ATTOM analysis of loan data. "Online lenders like us exist because banks and large lenders don't play in this space, and they aren't using technology to be efficient, nimble and fast. Now that investors have digital-native lenders catering to them, financing becomes an attractive alternative to cash. We predict this trend will continue because 2018 is already off to an incredible start for us." Flipped homes originally purchased by the investor with financing represented 34.8 percent of homes flipped in 2017, up from 31.6 percent in 2016 to the highest level since 2008 -- a nine-year high. 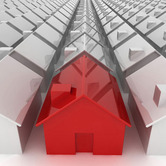 "Institutional demand in this space has grown substantially over the last several years. 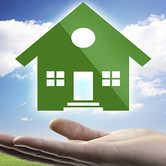 Fix-and-flip has become an asset class of its own that is well-financed by banks and highly sought by institutional buyers," said Maksim Stavinksy, co-founder and COO at Roc, a nationwide originator which saw close to double the dollar volume of loans on home flips completed in 2017 compared to 2016, according to an ATTOM analysis of loan data. 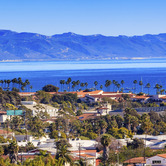 "Across Southern California, the flipping of investment properties continues to be a challenge, due to low available housing inventory, which is in turn driving up pricing and downsizing profitability for investors," said Michael Mahon, president at First Team Real Estate, covering Southern California. "To best position cash available for investment, we are experiencing more investors looking to utilize loan financing as leverage, as opposed to all-cash purchases, in an effort to capture greater numbers of investment opportunities, as opposed to maximizing individual profitability on investment projects." Of the homes flipped in 2017, 17.6 percent were sold to FHA borrowers -- likely first-time homebuyers -- down from 19.4 percent in 2016 to a three-year low. 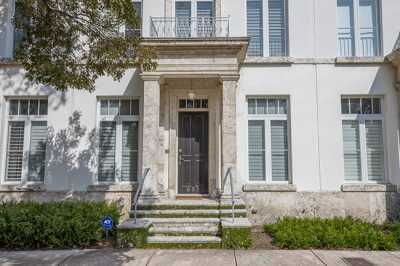 "We are seeing an entirely new category of sellers on Roofstock made up of investors choosing to buy/fix/lease/sell with a tenant in place versus buy/fix/flip vacant via the MLS," said Gary Beasley, CEO and co-founder at Roofstock, an online marketplace for investment properties. "This allows home flippers to reduce their selling costs, earn income during their hold period rather than having carrying costs, and potentially turn their capital faster. 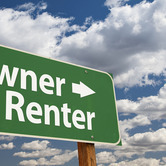 The availability of data on where single-family rentals are trading on a cap rate basis allows value-add investors to back into the prices they can pay based upon their targeted profit margins and estimates of renovation costs and market rents, allowing them to take advantage of robust investor demand for cash-flowing properties." Among the 52 metro areas analyzed in the report with at least 1 million people, those with the highest share of completed flips sold to all-cash buyers -- often other real estate investors -- in 2017 were Providence, Rhode Island (43.1 percent); Birmingham, Alabama (42.8 percent); Oklahoma City, Oklahoma (41.0 percent); Orlando, Florida (40.4 percent); and San Antonio, Texas (38.0 percent). 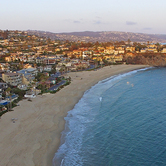 "I think it is starting to feel a little like 2007 again, only with one major difference: the people buying investment properties are not 'sub-primers', but investors with more sophisticated deal sourcing methods," said Brad McDaniel, co-founder and CEO with Likely.AI, a company that applies artificial intelligence and machine learning to predict which homes are likely to be good deals for investors. "One of our clients, in the wholesale business, made a strategic move to become more data-driven in all aspects of their business. I believe this trend, the adoption of big data, and AI by residential real estate investors, is in its infancy. It's been said that real estate is a laggard when it comes to technology adoption; that is changing because of AI." "I believe the drop in Seattle home flipping can be attributed to the large number of buyers that home flippers are competing against in the market," said Matthew Gardner, chief economist with Windermere Real Estate in Seattle. "As a result, they're being forced to pay more which cuts deeply into potential profits -- also down from last year. I anticipate that supply limitations, in concert with rising home prices, will continue to put downward pressure on the number of flips in the Seattle market in 2018." Homes flipped in 2017 took an average of 182 days to complete the flip, tied with 2016 for the highest average days to flip since 2006 -- an 11-year high.